Even in its most basic form – say, a bad name or off-color joke – online harassment is a malleable concept. It can be highly contextual and often a matter of personal interpretation. And while certain behaviors would seem to “cross a line,” that line can vary from one person to the next. Respondents who indicate they have personally experienced any of these behaviors online are considered targets of online harassment in this report. Further, this report distinguishes between “more severe” and “less severe” forms of online harassment. Those who have only experienced name-calling or efforts to embarrass them are categorized in the “less severe” group, while those who have experienced any stalking, physical threats, sustained harassment or sexual harassment are categorized in the “more severe” group. This study measures the prevalence and patterns of online harassment by examining six broad categories of abusive behavior (see “Defining online harassment” in the accompanying box). These categories are identical to those used in Pew Research Center’s 2014 examination of online harassment. They are designed to capture a broad range of experiences – not just severe forms of abuse, but also everyday forms of harassment that users might overlook. 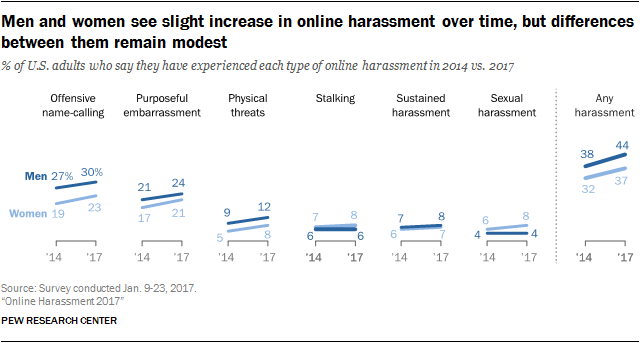 All told, 41% of Americans have been the target of harassing behavior online, a modest increase from the 35% of adults who were targets of online harassment in the Center’s 2014 report on the topic. As was the case then, this survey finds that two types of harassing behavior are especially widespread. About a quarter of American adults (27%) say they have been called offensive names online – up 4 percentage points from 2014 – while 22% say that someone online has tried to purposefully embarrass them. For many, name-calling and embarrassment are the starting and ending point for their harassment. Some 22% of Americans – or roughly half of those who have experienced harassment at all – have encountered online harassment that went no further than these two behaviors. While these experiences can certainly be troubling, those whose encounters with harassment are limited to these behaviors generally find them to be a tolerable nuisance of life online. Throughout this report, the 22% of adults who have only experienced name-calling or efforts to embarrass them – and none of the other four experiences measured in the survey – are referred to as targets of “less severe” forms of online harassment. Smaller – though still notable – shares of Americans have encountered more pernicious forms of harassment. One-in-ten have had physical threats directed at them online, while 7% each have encountered sustained harassment or stalking, and 6% have been sexually harassed. In total, 18% of U.S. adults have experienced one or more of these “severe” behaviors online. To be sure, these more serious behaviors are not isolated from name-calling and embarrassment: 72% of those who have experienced these more serious types of harassment have also been called offensive names or purposefully embarrassed. But for this analysis, the 18% of Americans who have encountered any of these serious behaviors are referred to as targets of “severe” forms of online harassment. As will be discussed later in this report, those who face these more serious behaviors are generally more likely to report significant negative consequences from their experiences. Many Americans have experienced harassing behavior online, but harassment is an especially common fact of online life for younger adults. Nearly half of Americans ages 18 to 29 say they have been called offensive names online (46%) while more than a third say someone has tried to purposefully embarrass them (37%). And beyond these behaviors, noteworthy shares of young adults have been subject to more serious forms of abuse. One-quarter (25%) have received physical threats online, while smaller but still notable proportions have been sexually harassed (15%), harassed for a sustained period of time (16%) or stalked (13%) online. All told, roughly two-thirds of young adults (67%) have been subject to some type of online harassment – with 41% having experienced severe forms of harassment. All of these figures are statistically unchanged from the Center’s previous survey of online harassment conducted in 2014. 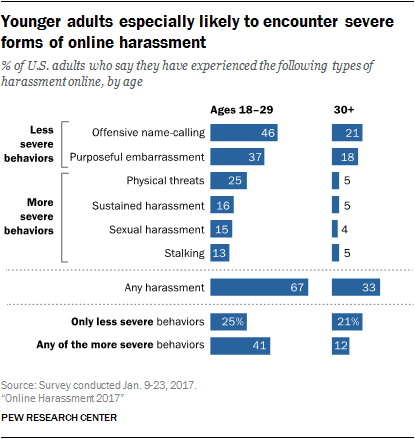 Although young people are exposed to harassment online at especially high levels, the proportion of Americans in other age groups who experience online harassment is notable – and growing. Fully 49% of adults ages 30 to 49 have personally experienced any form of online harassment, up from 39% in 2014. And almost one-quarter of Americans 50 and older (22%) have been the target of online harassment, an increase of 5 percentage points from 2014. Overall, men and women differ modestly in the types of harassment they encounter online. Men are somewhat more likely to be called offensive names (30% vs. 23%) and to receive physical threats online (12% vs. 8%), although other behaviors – like embarrassment, stalking or sustained harassment – show no statistically significant differences by gender. Overall, men are slightly more likely to experience any form of online harassment (44% vs. 37% of women). Still, sexual harassment is more common among women than among men and is a particular problem for young women. Among adults ages 18 to 29, women are more than twice as likely as men to report experiencing sexual harassment online (21% vs. 9%). And among the youngest adults – those ages 18 to 24 – women are more than three times as likely to be sexually harassed online (20% vs. 6% of men). As was true in the Center’s 2014 survey of online harassment, blacks also tend to encounter harassment online at high levels. Overall, 46% of blacks – and 59% of black internet users – have experienced any type of online harassment. In terms of specific behaviors, blacks who go online are especially likely to say that they have been called offensive names (38% compared with 28% of white internet users) or to say that someone has tried to purposefully embarrass them (34% vs. 23%). Many Americans who have encountered online harassment feel their experience is at least in part the result of some aspect of their identity. This ranges from traits like one’s political views to their race/ethnicity or gender. The survey asked about a number of specific reasons people might experience harassing behaviors online. Some 14% of Americans – representing 35% of those who have encountered any type of harassment online – say they have been targeted with abusive behavior online because of their political views, making this the most common response. Men are more likely than women to say they have been harassed as a result of their politics: 19% of men and 10% of women say they have been harassed online for this reason. Democrats and Republicans are equally likely to be harassed online for their political views. Along with political views, 9% of Americans say they have been harassed online because of their physical appearance, while 8% each have been targeted because of their gender or race/ethnicity. Gender-based harassment is more common among women: 11% of women (and 21% of young women ages 18 to 29) have encountered this type of harassment, compared with 5% of men. Similarly, 25% of all black adults and 10% of Hispanics have experienced harassment online as a result of their race or ethnicity; just 3% of whites say this has happened to them. In addition to these factors, smaller shares of Americans say they have been subjected to online harassment as a result of their religion (5%), sexual orientation (3%), occupation (3%) or disability status (1%). In many cases, the repercussions of online harassment extend beyond the online environment. 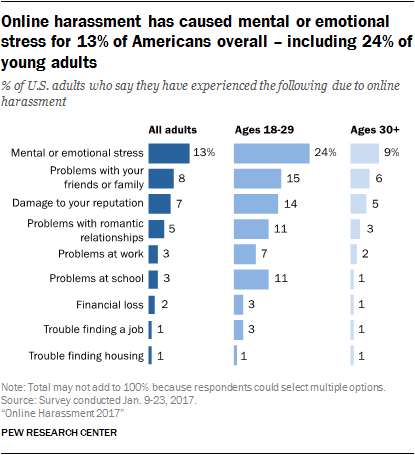 Most prominently, 13% of U.S. adults (or 31% of those who have experienced harassment online) say they have experienced mental or emotional stress as a result of online harassment. Another 8% indicate that these experiences have caused problems with their friends or family, 7% say their reputation has been damaged and 5% say their romantic relationships have been harmed. Smaller shares say that online harassment has led to problems either at their job or school (3% each), a financial loss (2%), trouble finding a job (1%) or trouble finding housing (1%). Overall, one-in-five Americans (20%) say they have faced any of these consequences as a result of their harassment experiences. Young people tend to experience these aftereffects of online harassment at relatively high levels. Roughly a quarter of 18- to 29-year-olds (24%) have experienced mental or emotional stress as a result of their online harassment (24%). Another 15% report problems with their friends or family, 14% say their reputation has been damaged, 11% each have had problems with romantic relationships or problems at school and 7% have had problems at their job. In all of these cases, young adults report these consequences at significantly higher levels compared with their older counterparts. As noted earlier in this chapter, 18% of Americans have experienced severe forms of online harassment such as physical threats, stalking, sexual harassment or sustained harassment. And compared with Americans who have “only” been called offensive names or embarrassed online, this group is much more likely to experience offline consequences due to their harassment online. Those who have experienced severe forms of harassment are especially likely to say that they have been targeted because of specific personal characteristics. About one-third of those with severe harassment experiences say they have been targeted due to their gender (32%) or physical appearance (34%), and sizable shares have been targeted due to their race or ethnicity (23%) or sexual orientation (13%). In addition, 45% say they have been targeted due to more than one aspect of their identity. Those who have faced severe forms of harassment are also more likely to report a range of offline consequences. Fully 45% say online harassment has caused them mental or emotional stress, around one-quarter say it has caused problems with their friends or family (24%) or damage to their reputation (25%), and 18% say it has resulted in problems with their romantic relationships. This group is also more likely to say that online harassment has led to problems at their job or at school, financial loss, or trouble finding housing. And as was true of the reasons people might be targeted for abuse, those who have faced severe types of online harassment are more than twice as likely to experience more than one of these offline consequences (37%, compared with 15% of those whose harassment does not include severe behaviors).